#5: Humpbacks... and more fog! On Monday when we checked the weather forecast, our crew in Lubec was excited by what we saw: a potential break from the fog banks that had been keeping us stranded. After six days on land, we were all itching to get back on our research vessel, Nereid. This is my first season with the New England Aquarium Right Whale Research Team. I have worked around large whales in the wild—and unpredictable weather—before. Last summer I was in Gloucester, Massachusetts, studying humpback whales with the Whale Center of New England, and prior to that I worked aboard a whale watch vessel out of Portland, Maine. At the Whale Center, our focus was on matching humpback whale flukes and documenting behavior patterns. There is plenty to do at here at the Lubec field station while we wait for the fog to lift, such as matching past right whale sightings to individuals in our Catalog. Matching humpback whale flukes is much different than matching callosity patterns on right whales; right whales are more challenging. After several consecutive days on land, gazing at callosities on the computer, all you want to do is get back on that boat! We took off at 9:30 AM on Tuesday, hoping that the last of the fog had dissipated. As we steamed out with the R/V Callisto (carrying the acoustic research team) following closely behind, we watched as wisps of fog floated among West Quoddy Head and Campobello Island. It was strikingly beautiful, and made for a lovely trip out into the channel. We spotted lots of harbor porpoise and a few minke whales near Grand Manan, and as our watch continued we saw two blows in the distance—two adult humpback whales! For a while we thought perhaps we had four humpbacks. These individuals were moving quickly and surfacing far from where they last dove, so when they resurfaced we didn’t think they were the same animals. Also, these two humpbacks were only taking one or two breaths at the surface before going on a deep, terminal dive. This is unusual for humpbacks, who generally take five or more breaths before taking another dive. Perhaps beneath the surface there were a lot of small fish they were chowing down on! After photographing the flukes of the humpbacks, we headed south- but not for very long. 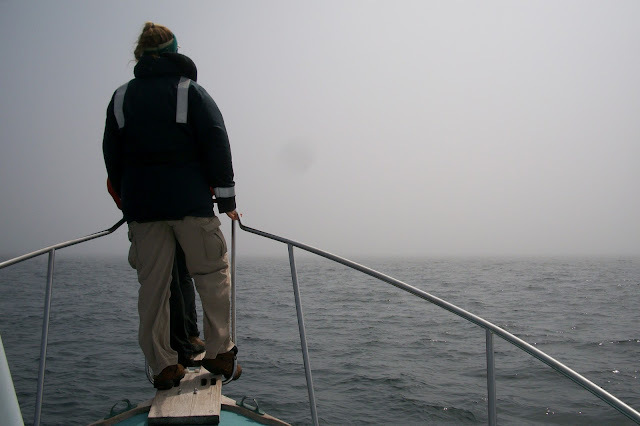 We encountered an extensive, heavy fog bank which halted our survey for the day. While some would consider this really frustrating, even half days on the water are valuable. We were still able to collect data on other marine species, and shot some photos that will benefit humpback researchers. Getting a chance to record data, do some photography, and chat with the rest of the crew is good experience and a lot of fun. And when the day comes when there is no fog and tons of right whales, I’ll be totally prepared! Edit: Thank you to Danielle Dion of Quoddy Link Marine for the Humpback ID's! #11: A Bowhead Whale in the Bay of Fundy?! #9: Calves Just Want to Have Fun! #8: The 2012 Calf of #3390 puts on a show! #7: They have finally arrived! #3: Where are the right whales?